Cycle-smaht #nohocx – Team Monster Truck p/b Hub Bicycle Co.
It’s been a bit quiet on the blog end and thus the race report end, but we’ve been busy… racing. Drafting: it’s a legitimate strategy. Photo courtesy of Scott Yarosh. I’ve heard it said that #nohocx is the jewel in the crown of New England Cyclocross. Granted, when I think of a crown, there’s more than one jewel, but it’s still an apt description considering the CSI race has been around for 25 years. So, time (25 years) + heat (the heat of battling racers, as it were) + pressure (even though I’m not a race promoter/organizer, I can imagine they go through quite a lot of this) = one of the hardest, finest, shiniest gems around. Broad, sweeping open power sections. Sand traps that would give golfers nightmares. Steep, rooty runups and swift downward chutes. Off camber and single tracks in the woods. Beer tent barriers. There’s something for everyone here. My main goal this season was to squeak into as many top 50% placements in races as I could. While I haven’t finished there in every race (Forest Park, Providence and Fruitlands are particularly distinct outliers compared to the mostly 50-60% finishes I’ve pulled off), I’m starting to see actual progress considering I haven’t done any real structured training. Why all the data? This is a race report, right? Well, I may have mentioned this before, but I felt like I had a score to settle at Cycle-smart International in NoHo this year. 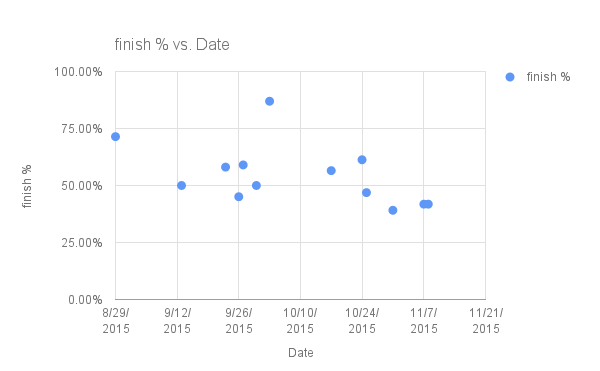 In 2014, it was easily my worst performance where I finished in the 80th percentile (43/51 on day 1 and 40/55 on day 2). My quick release skewer came undone after it hit a tree root, causing me to go all Jack and Jill down the off-camber u-turn. I couldn’t fight the wind. It was raining. I was feeling sick. Blah blah blah excuses. Or at 41.82% Via CrossResults.com. I feel like I’ve sufficiently redeemed myself, even though I was hoping to crack the top 20 on day 2. Granted, circumstances were vastly different this year considering how much warmer and drier it was in NoHo compared to the cold November rain of 2014. Still, any time I want to kick myself for not doing better, not catching the rabbit (my term for fellow cat 4 friend who is faster than me) in the field I was chasing, I have to look at the data and recognize that I’ve made a lot of progress all things considered. When I look at my Strava data, it’s even more interesting (that is to say if anyone finds my data-nerding interesting). My heart rate on average is about the same and even the maxes don’t differ much, but I’m going almost an entire mph faster on average, but with lower max speeds (probably means less hard sprinting in trying to catch up). Harder. Better. Faster. Stronger. Indeed. Even after eating it in the sand day 1 (resulting in some rather creative tegaderm placement) and breaking a spoke and eating it on the barriers on the third lap of day 2, I still finished much better than I did last year. It’s definitely not because of improved fitness. If anything, I should give Myerson-sensei and all the other -sensei and -senpai at Cycle-Smart Cyclocross Camp all of the credit for improving my technique to the point where I don’t bobble or hesitate as much as I used to; or even if I bobble, the knowledge of how to handle it so I can recover quickly and keep moving. Not to mention, Adam’s tip about drafting in the open power section more or less saved me (hence the extra mph average from not completely gassing myself early). Also, extra thanks to the fierce women of #necx for being some of the fastest (but also kindest and most supportive) rabbits to chase (and draft). Now if you’ll excuse me, I have a date cuddling with a frozen bag of peas until MonstahCross and Shedd Park this weekend. Apparently one thing I couldn’t get out of my system after cross camp is my affinity towards bruising like a grape.